Usage-based Insurance set for the mainstream? You are here: Home / Blog / Usage-based Insurance set for the mainstream? 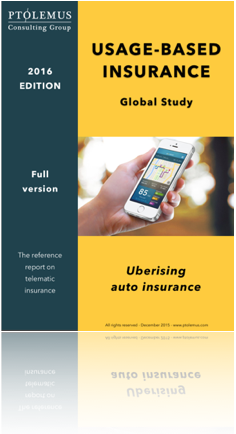 PTOLEMUS tracks the UBI / insurance telematics landscape on a regular basis. We notably published a 400-page report on the subject last June. We are currently seeing the insurance market move from suspicion to recognition of the model. Within a few days, the economic press has issued numerous articles on the subject, highlighting both its major potential as well as its challenges. The Wall Street Journal associates UBI with Big Data, as insurers get hold of precious, high quantity customer data to improve their ability to evaluate risks. The Economist, which quotes PTOLEMUS, emphasises customers’ dilemma between what they may perceive as an infringement on their privacy and premium discounts. The specialised press is also very active. Transportation Nation investigates the launch of UBI in New York City by Progressive and Allstate and the potential of telematics to benefit typical urban low-mileage drivers. Finally, Insurance Technology focuses on Aviva‘s launch of its smartphone application. 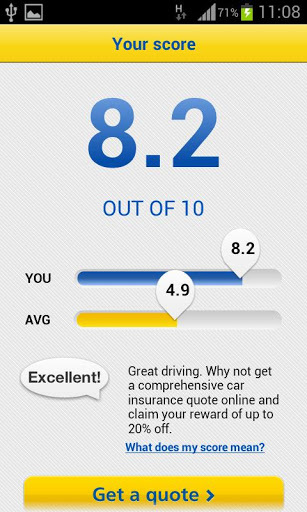 RateMyDrive enables young drivers to obtain a discount of up to 20% on their insurance quote based on their driving score recorded during at least 200 miles. This is clearly an interesting move from a company that epitomized the complexity of making Pay as you Drive (PAYD) work in 2008. 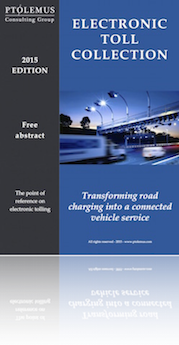 Since then, the insurance telematics market has transformed itself completely. First, the cost of technology has decreased radically. Not only have black boxes become much more affordable. But new devices have appeared. OBD (On-board Diagnostics) dongles, which can be installed by the policyholder himself, are starting to emerge in Europe too. Smartphones, which do not cost underwriters anything, can also be used to provide valid data collection. Secondly, automotive OEMs are starting to embed the UBI functionality in their connected car devices. We expect this to be particularly important in Europe due to the mandated launch of eCall in the EU (by 2015) and ERA Glonass in Russia (by 2014). Then, all new type-approved cars will be line-fitted with a telematic device, that can be use to provide multiple services including UBI. This could also happen in Brazil if the government finally goes ahead with the mandated stolen vehicle recovery (CONTRAN 245) functionality for all new vehicles. Major car makers such as Ford, Vauxhall (GM Group) and Citroën are already launching models with an UBI offer in the US and the UK and we expect this to become more prevalent in the coming months. Third, we expect the EU telematic market to benefit from the effect of the gender ruling by the European Court of Justice. This judgment prevents insurers from setting insurance prices using the gender factor and creates the opportunity for telematics to be a substitute for safe driver detection. It is already pushing brokers such as Sheila’s Wheels – focused on female drivers – to reinvent themselves through telematics and insurers such as Insure the box to target young women aggressively, notably by launching the Drivelikeagirl.com brand. 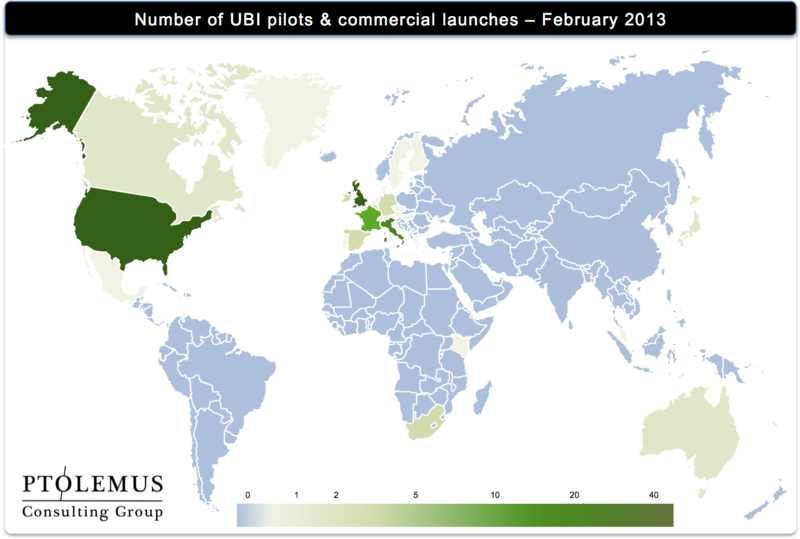 Fourth, UBI is gradually becoming a global game, as shown in the map hereafter. After the US and Italian markets, which have shown the way, numerous countries are starting to experiment with the technology. 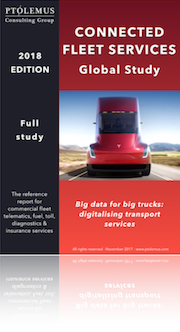 The UK is the fastest growing telematics market worldwide, with both start-ups such as Insure the box and Ingenie and large insurers such as Co-operative Insurance driving the change. Despite its economic difficulties, Spain is also a very promising market, thanks to Mapfre but also Generali’s recent launch of a full PHYD offer. More generally, PTOLEMUS is seeing its report sold across the world and particularly in new markets such as Australia, Canada, China, India, Japan and South Africa. The global landscape of purchased reports (which in our view is a proxy for future UBI projects) contrasts with the landscape of launches & trials (the past & present of UBI). Last but not least, the range of suppliers is broadening and we expect this to play a big impact in opening new markets and business models. 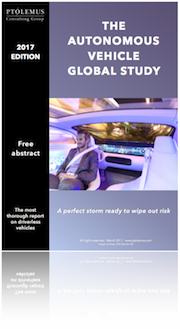 Along the pioneers (Octo Telematics, Xirgo, Danlaw or Cobra Automotive), new insurance-focused players have emerged such as Evogi in the US or Wunelli in the UK and they are gaining traction. These iTSPs (Insurance Telematics Service Providers) not only bring the technology solution but also the actuarial & data management capabilities to translate technology into business. At last, mobile operators are starting to wake up to the opportunities offered by vertical M2M markets and notably insurance. This started in the US, with Verizon Wireless acquiring Hughes Telematics last year and Sprint developing an end-to-end proposition. European operators such as Vodafone, Telefonica or Telekom Austria have also built integrated solutions for insurers. Telefonica recently announced that it had won a deal with Generali in Spain. In addition, we understand that Vodafone is about to announce a partnership with a major European insurer. Of course, challenges remain such as the acceptance of the model by all consumers. Overall, however, the market has translated challenges into solutions, at least in the personal line segment. For example, smartphones could become the killer model to succeed in intermediate premium markets, such as France and Germany. Even privacy seems to become a less critical hurdle. According to a recent ABI (Association of British Insurers) survey, 41% of UK drivers would “consider taking out a motor insurance policy with telematics”. This offers insurers a sizeable market to tap into. 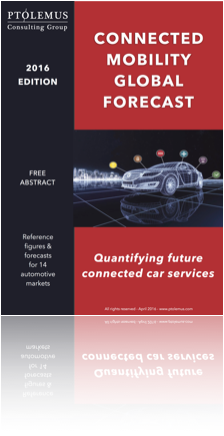 As a result, we stand by our market forecasts and expect over 100 million drivers to use telematics by 2020 globally. While the UBI market will certainly experience other ups and downs, it is just too big to stop now.